Becca Fitzpatrick Archives - Book.Blog.Bake. Ah, those used book sale finds. Sometimes you hit gold, sometimes it’s a miss. 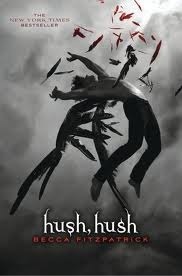 I was drawn to Hush, Hush because of the cover, and even though paranormal romance isn’t normally my kind of thing, the idea of a fallen angel sounded interesting, so I went for it. Verdict? This one’s a miss. This book had potential. Individually, I liked the characters, just not in their designated roles. I found Patch beyond creepy, and I don’t think he’s a good love interest for Nora at all. I don’t find his stalking/threatening ways romantic. I’ve never been one to go for the “bad boys” anyway, but Patch goes from bad boy territory to bordering on villain ville, at least in this book(by the end, things seem like this might be slightly better in the sequels, but I’m not sure.) I won’t say who the ultimate villain ends up being, but personally, I think he’s the most sympathetic person in this cast of characters. Nora’s character is consistent throughout the book, until the last fifty pages of the book, where she does something that’s suppose to be seen as brave. Now, I am all for brave characters, but I really didn’t see anything leading up to this point that would make it believable for me. I was really hoping the last fifty pages would redeem the rest of the book for me, but I just couldn’t buy what was happening. The plot in the book is fairly interesting, and what was kept me intrigued. At times, the writing shone through, and I could feel Nora’s apprehension. However, there were too many awkward sentences for me to sometimes get past that. Also, there’s a rollercoaster ride named “The Archangel”, which becomes some heavy-handed symbolism. Overall, it just felt like this book was trying too hard, and it distracted me from the overall story. The thing that really gets me about this book is it really did have potential. Parts of this book are good, and entertaining, even. As it is, it was a bit of a disappointing read that perpetuated all the wrong stereotypes in the genre. Final Impression: Quick read, but too many problems for me to embrace it. Don’t recommend it. 1/5 stars.